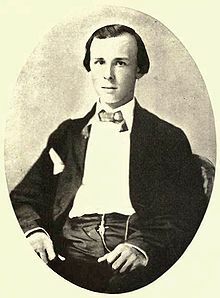 James Ryder Randall (January 1, 1839 – January 15, 1908) was an American journalist and poet. He is best remembered as the author of " Maryland, My Maryland". ^ Maryland State Archives (2004). Maryland State Song – "Maryland, My Maryland". ^ Phair, Monty. "A Brief History of Randallstown". Baltimore County Public Libraries. Retrieved 2012-12-05. ^ a b Dwyer, William (1911). "James Ryder Randall". The Catholic Encyclopedia. 12. New York: Robert Appleton Company. Retrieved October 12, 2009. ^ "James Ryder Randall". baltimoreauthors.ubalt.edu. Retrieved 23 September 2017. ^ "James Ryder Randall Papers, 1855-1864; 1905-1912". 2.lib.unc.edu. Retrieved 23 September 2017. ^ "Tour highlights Civil War sites in Augusta". Retrieved 23 September 2017. ^ "Monument to the Poets of Georgia Augusta Georgia". Ohwy.com. Retrieved 23 September 2017. ^ "Frankies Confederate Monuments and Memorials of the South". Oocities.org. Retrieved 23 September 2017. ^ "Home". 1.pgcps.org. Retrieved 23 September 2017. Wikimedia Commons has media related to James Ryder Randall.